I'm pretty sure these aren't scones, but what are they? We've made a type of deep fried bread in my family for years, which we've called "scones". I'm fairly certain these aren't actually scones, and have no idea what their name would properly be. 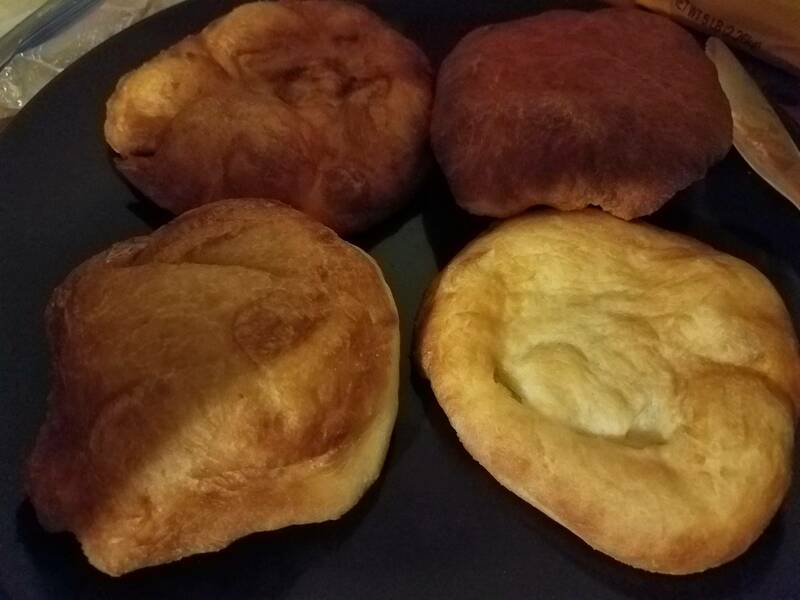 The recipe is very free-form, and uses whatever bread dough happens to be on hand. The last time I made it I used bread-machine pizza dough, previous times I've used dough from sourdough bread, no-kneed artisan bread, and baguettes. The dough is pulled into thin disks, whose shape and thickness are generally close to, but not quite, uniform. The dough is then deep fried, cooled on a rack over paper towels for the oil, and is ready to be eaten. The end result looks like this: The valleys are generally filled with jam, butter, honey, or honey butter. So my question is: does this have a name? Scones are one of the many alternate names given in the linked wikipedia article. This is a staple of Balkan cuisine. You will see it named Lángos (and derivatives) in Hungary and Mekitza (and derivatives) in Slavic languages. Either of these words is used in Western Europe, depending on which group popularized it there. I am not sure this wording has spread outside of Europe, and cannot say if it was imported in the USA or developed there independently, but it is certainly the same end result. It's a party food also in the south of Italy, usually prepared as street food too. We call it "pizzillo", and it's made by deep frying the same bread dough used for Naples' pizza, and served with a little of salt on top of it. Search "pizzillo fritto" ("fritto" means "fried") on Google Images, not all images are correct, but you'll find a lot of pictures identical to yours! Source: I'm from the south of Italy, and my dad and his mom always made it. 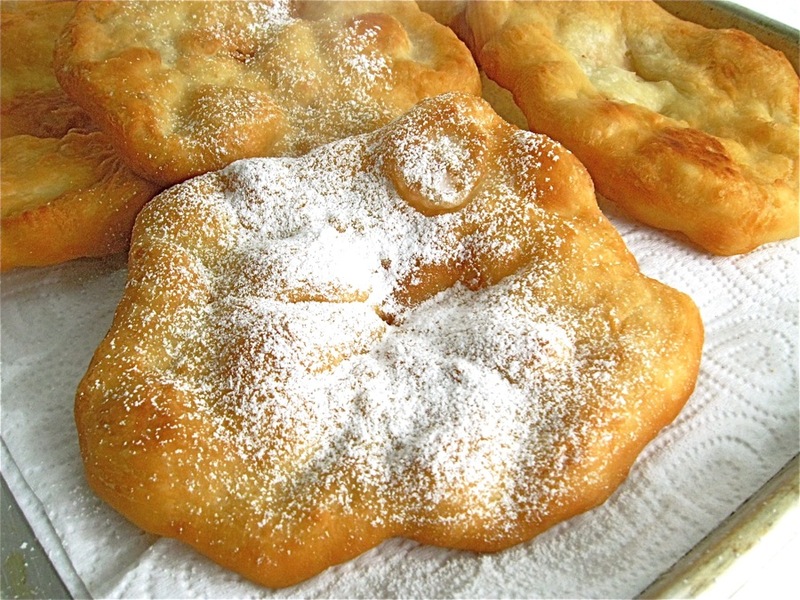 Fry bread. They are often served as tacos with savory toppings. Sweet toppings like butter, honey, or cinnamon are also common. They are also similar to sopapillas. As far as I can tell, these are called scones only near Utah, USA. I haven't been able to figure out why. Some guess that it is related to the sconecutter restaurant. Everywhere else in the world scones are biscuit-like pastries. Looks like a Kiachl, a traditional dish from Tyrol and Bavaria. Here in Austria, we serve it either as a sweet dish with cranberry yam and sugar or "piquantly" with Sauerkraut. It's a yeast dough where you pull the edges of it towards the outside so the middle becomes thin, while the edge becomes thick and fluffy. The dish has a variety of synonyms. Depending os where in Austria you are, it is called "ausazochene Nudeln" (noodles pulled towards the outside), Kiachl or Ziachkiachl (pulled Kiachl). Not the answer you're looking for? Browse other questions tagged bread deep-frying food-identification or ask your own question. What exactly are Bamboo shoots? I want to duplicate my bread mistake! What are the names of these food dishes? What are the names of these vegetables? What are these two vegetables called?